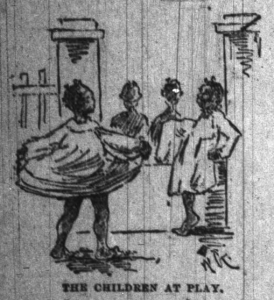 In July, 1892 the Indianapolis News provided this imaginative picture of children at the Colored Orphan’s Home (click for an expanded view). In the 1890s the Lessenberry and Edmonds families were among the scores of African Americans migrating to Indianapolis. The two Kentucky families were part of a wave of African Americans who swelled the Circle City’s population in the early 20th century. Fueled by post-Emancipation optimism as well as a sober acknowledgment of Jim Crow racism, many African-American families went north to cities like Indianapolis. James Edmonds and his three children came to Indianapolis in 1890, and Price and Amy Lessenberry and their four children followed in 1898. The families were compelled to contend with Hoosier racism and segregation in their new home, and they were among the many newcomers whose lives were transformed by impoverishment and a segregated social service system.